Gain 8credit and draw 4 cards. It required a hexadecimal code along with biometrics, delivered by way of BMI. How does "After you resolve this operation, end your action phase." on terminal operations like Violet Level Clearance work? If the Corp plays Violet Level Clearance as the first operation for Subcontract, what happens? The game advances to the discard phase following the resolution and trashing of Violet Level Clearance. The paid ability window that would normally follow the action of playing Subcontract is skipped, and no pending abilities or triggers are resolved - including the playing of a second operation with Subcontract. The played Subcontract is immediately trashed by the game because its resolution is ceased and considered complete. If the Corp plays Violet Level Clearance as one of the operations looked at by Accelerated Diagnostics, what happens? The game advances to the discard phase following the resolution and trashing of Violet Level Clearance. The paid ability window that would normally follow the action of playing Accelerated Diagnostics is skipped, and no pending abilities or triggers are resolved - including the playing or trashing of any remaining cards looked at by Accelerated Diagnostics. The played Accelerated Diagnostics is immediately trashed by the game because its resolution is ceased and considered complete. When in the game do you want to draw 4 cards at the end of you turn as corp? The short answer, you absolutely do not want to. This card is pretty much made for Cerebral Imaging: Infinite Frontiers. Outside of it, I don't very, very little use for this card, especially with it being 3 influence. 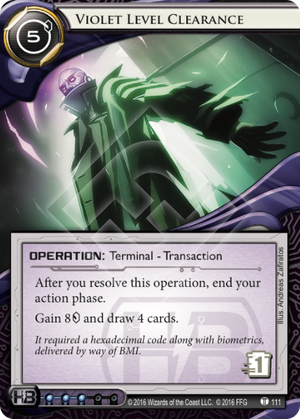 With the upcoming rotation of Jackson Howard, this card will be such a detriment to use unless you use it in Cerebral Imaging: Infinite Frontiers.